Machined from high-strength aerospace aluminum, the SureFire PenTM III is available with an incredibly tough Mil-Spec hard-anodized body in your choice of tan or black. The tan model comes with black hardware: diamond-like coating on the pocket clip and nose cone, black oxide on the retractor button. 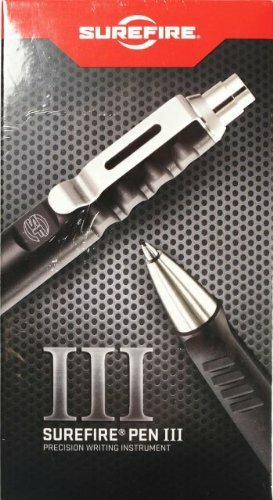 The black Pen III comes with a stainless steel finish on the pocket clip, tip, and retractor button. Inside is an imported Schmidt® easyFLOW 9000 ballpoint pen cartridge for smooth, reliable writing performance. Like our other SureFire Pens, this handsome high-performance instrument is tough enough to provide you with a tactical advantage in an emergency. Features rugged aerospace aluminum body with Mil-Spec hard-anodized finish, Heavy-duty stainless steel pocket clip, Schmidt® easy FLOW 9000 ink cartridge flows flawlessly, Ink tip retracts into body, no cap to lose.